Ted Giannoulas considers himself to be a performance artist. He acknowledges that lifting your leg toward an umpire while dressed in a chicken suit doesn't bring about many comparisons to a ballet dancer or a Broadway actor. 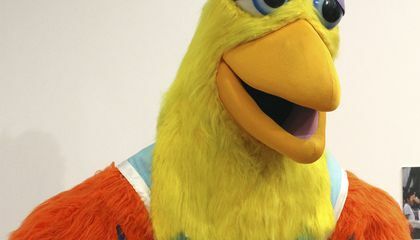 But Giannoulas said he's honored that his irreverent San Diego Chicken character is being recognized as art in a new exhibit at the University of Connecticut's Ballard Institute and Museum of Puppetry. "I basically took the inanimate object of a costume and became a big fuzzy Harpo Marx," Giannoulas said in a telephone interview. "As irreverent as it may seem, maybe this exhibit will focus a little more attention to the importance and detail of what a character brings to sports and other events. A lot of people come to these things just to see our comedic antics." John Bell, the museum's director and a puppet historian, said he hopes the exhibit, "Mascots! Mask Performance in the 21st Century," also serves to bring a bit more attention to puppetry and its place in popular culture. "The culture of masked performance is all around us, at sports events, amusements parks and in advertising," he said. "But I feel if you asked somebody, people would think of it as being something from some non-western culture or some primitive context. And yet these characters are vibrant and lively and people have a real attachment to them." 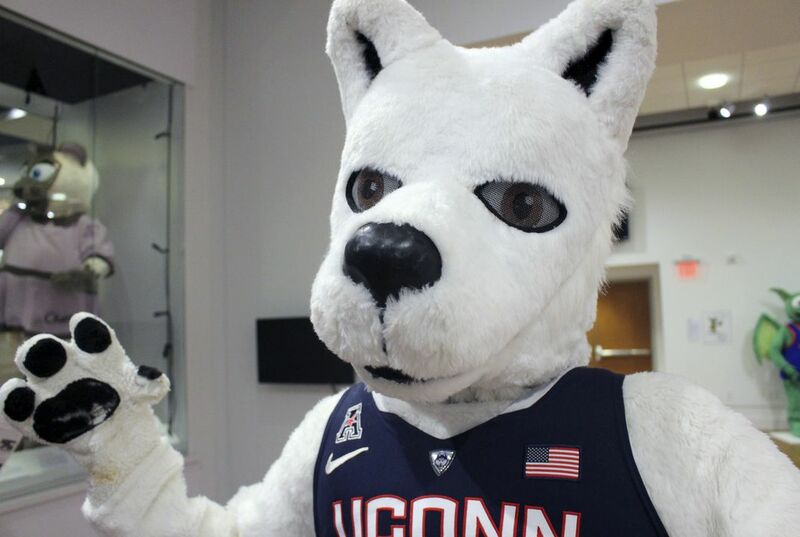 The exhibit features more than a dozen college and commercial mascot costumes. It includes Giannoulas' Chicken. It also includes the Boston Red Sox mascot Wally the Green Monster and the University of Nebraska's Lil' Red. It was one of the first inflatable mascots. There are biographies to read and displays about how mascots are made and the advancements in costume cooling technology. "Nowadays they make costumes that have air conditioning," said Giannoulas, who has been performing his chicken act since 1974, when he was hired to promote a local radio station at a Padres baseball game. "Not mine. It was a very low tech chicken suit. It was very hot, sweltering and laboring in there." On Dec. 7, there will be forum at the institute with A.J. Mass, who spent several years portraying Mr. Met for the New York Mets. It will also include Dave Raymond, a professional mascot who was the Philadelphia Phillies' first Phillie Phanatic. Mass said it's not easy performing in front of 50,000 fans. He considered himself a puppeteer, saying he had to move the eyes and eyebrows manually. "You are much more than a guy in a suit waving," he said. "You are a character. You are performing." Bell said it wasn't easy getting mascots to donate their costumes or talk about what they do. There are unwritten rules of the profession that prevent many mascots from showing themselves outside of their costumes, he said. "There is a real mystery about them," he said. "You're not supposed to know who performs them to preserve the fantasy. It's not easy to get beyond that." And few organizations have thought to preserve their costumes, he said. Those on display at the Ballard Institute were all worn by mascots. They show the wear and tear, from sweat stains to rips. "It's hard to borrow them, because either they are on the field being used or they've been worn out and they are thrown in a dumpster," Bell said. "There hasn't been a sense that these are valuable art works or artifacts of popular culture." The tattered nature of the costumes also is a testament to the physicality of the art, Bell said. The best mascots are masters of dance, acrobatics and physical humor. "We have a video running in the gallery that shows what they do," he said. "It's incredible. It's like a circus performer. The performing chops they have are really impressive. They'd be noteworthy on any stage. Plus, they are doing it in the aisles or on top of dugouts, really difficult and unusual performance spaces." The mascots will be occupying space at the Ballard museum through Feb. 11. What are the challenges of performing as a mascot? I think its a great idea that they have created a museum just for mascots. I think it's an interesting idea that they have created a museum like this. It can show the hardships of being a mascot, just by looking at the costume.